Need more information about booking Home 602078 ? A spacious guest room with comfortable beds in quiet surroundings. And a personal service in a small scale B&B. Sounds like a good start for your stay in Umeå, wouldn't you say? 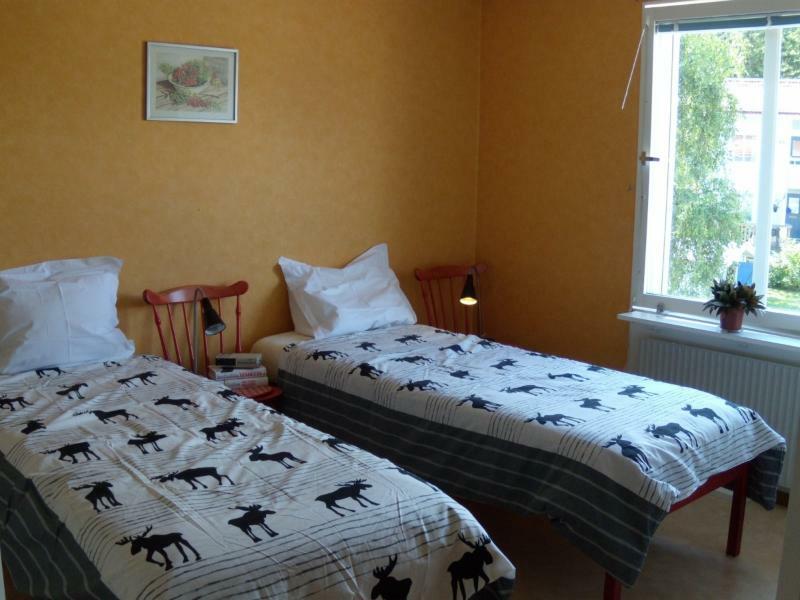 The guest room is perfect for singles, couples, friends travelling together, students, anybody who will appreciate an insight in the typical living area of Sweden. Our guest room suits 1 or 2 people. Beds can be made as 2 single beds or a double bed. The guest room is on the first floor, the guest bathroom is on the ground level. If you come with a larger group, we have more space for you in 2 other rooms in the house. Just get in touch, to discuss what can be arranged. All beds come with sheets and bedding. Towels are provided to all guests. Free unlimited wifi for all guests. Breakfast is not included in the price but can be ordered for a supplement of 60 SEK or 7 EUR per person per day. Breakfast includes home made bread and jams and regional specialities. Should you wish to cater yourself for lunch and dinner, you are welcome to use the kitchen. A convenience store is 700 meters away, open 7 days a week from 8AM to 10PM. Should you come by car, parking is included. Our house is 2 minute drive from the E4 motor way, so perfect if you are just passing through. The house and surrounding buildings are all strictly non-smoking. The outer yard has a playground for children, in a car-free environment. Summertime, you can enjoy the sun on either of our 2 patios. Wintertime, you can go cross-country skiing at the tracks, on just 5 minutes walking distance. We can recommend visiting the moose farm Älgens Hus in Bjurholm (70 km drive), going for a walk by the stream just 10 min away and maybe catch some fish. We will share more insider tips with you when we sit down at the kitchen table for a chat. Looking forward to welcoming you as our guest! With 2 local bus lines going every 10 minutes it is very easy to discover Umeå by bus. Buy a 72 hour card for 155 SEK and take the bus as much as you want during your stay. I am available to answer questions and give advice on what to see and do in Umeå. If the guests are looking for privacy I will respect their preference. 1/ The house is strictly non-smoking: no smoking even on the patios. Not respecting this rule means you will immediately be denied further access to our house plus fines to pay the cleaning costs. 2/ No perfumes or strong deodorants please, for allergy reasons. 4/ As in all Swedish houses: no shoes inside please. 5/ No surströmming inside the house or on the patio. Password for the wireless internet is available in the brochure in the room. You can get in touch with Darcia (the owner) through the contact form on this page. Send Darcia (the owner) an email through the contact form on this page. Alternatively, if there’s a phone number on this page, you can call them. How do I contact Darcia (the owner)? If you’ve already booked, go to Manage your holiday booking to view Darcia the owner's contact details or send them a message. Or send Darcia (the owner) an enquiry through the Contact the owner/manager form if you’d like a quote or more info first. When you pay online through the Book your stay form, a booking request is sent to Darcia (the owner). You’ll find out within 24 hours whether they’ve accepted - no money will leave your account before then. You can also request a quote from Darcia (the owner) through the contact form. The owner will email you the total cost for your dates and a link to book and pay online. Use the Book your stay form to pay provisionally online. You can pay by credit/debit card or PayPal. Darcia (the owner) will have 24 hours to accept the booking and no money will leave your account before then. Why can't I call Darcia (the owner) before booking? You’ll need to contact Darcia (the owner) to do this. Send them a message in Manage your holiday booking or through the contact form on this page. You can request to change the dates or number of people on your booking via the Manage your holiday booking page. To change your holiday dates use the Edit booking button. If you need to change the number of guests staying then send Darcia (the owner) a message. If Darcia (the owner) agrees, they’ll send you a revised quote outlining the changes. You can review and accept/decline this from the Manage your holiday booking page. You’ll have 48 hours to take action before the revised quote expires.